Joe Manganiello. Photo from bellanaija.com. I am not a fitness fanatic nor am I the type to engage in diets except for those that involve the free consumption of cupcakes and beer. However, I’d like to write a little about my adventures with sugar detox because I’ve recently seen some really neat, surprising results. And when most of your day consists of sitting in front of the computer writing romance novels ogling pics of hot cowboys on Pinterest, like me, you are going to be pretty excited about weight loss that doesn’t involve a lot of effort. First of all, in the last twelve days, I’ve lost ten pounds; second, I don’t feel hungry. Yes, I know both of those claims sound like I’m about to sell you snake oil. But I’m not. One of the things I like best about this plan is that except for a couple of specialized ingredients, you can do this with food from any supermarket. Breakfast. Blueberry/cranberry/almond milk shake with lots of seeds and healthy fats. Lunch. Lean protein with salad greens and different kinds of non-starchy vegetables. Dinner. More lean protein and some greens. Snacks. Raw nuts, raw veggies dipped in tapenade or almond butter. The detox removes all added sugars and artificial sweeteners from your diet. No dairy, no gluten, no legumes, no starchy vegetables. No rice, bread, or pasta. I thought that these draconian edicts were going to leave me a grumpy, ravenous T-Rex. But no! It’s really working for me, and I’d like to continue it for the next month to see how I feel over an extended period of time. You can read more about the plan and book here. FOR FREE! For lunch and dinner, I’ve learned to prepare some really bangin’ proteins to serve on top of salads or alongside greens and other veggies. I want to share these recipes with you because they follow the sugar detox, they’re simple to prepare, and they’re man-friendly. Very man-friendly. My husband absolutely loves the food I’ve been making lately. Joe Manganiello’s daily diet involves steak and chicken breasts. So I present to you my versions of steak and chicken. 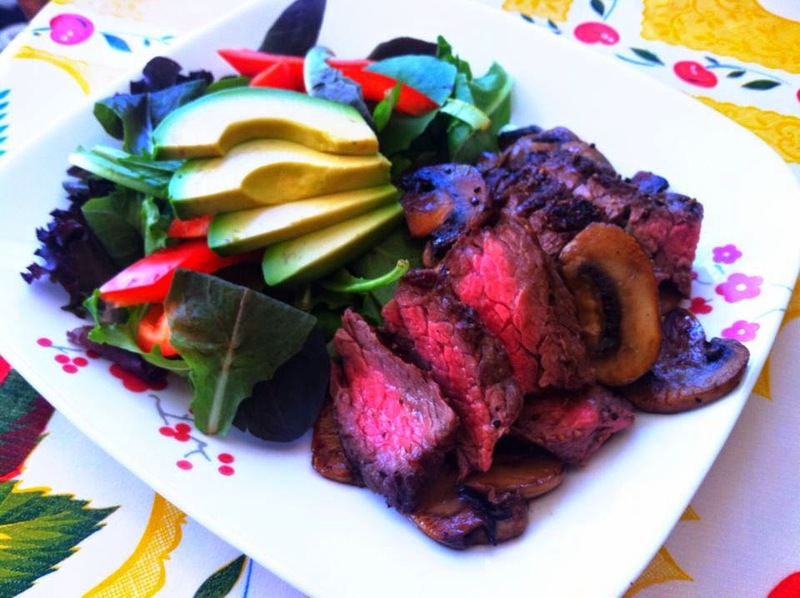 Steak a la Alpha with sauteed mushrooms and a green salad. Take off your shirt. Ogle at yourself in the mirror. Don’t smile, even though you know you look good. Put the steak between two pieces of plastic wrap. Using a mallet or meat tenderizer (or your fists! ), pound that meat to an even thickness. Generously salt and pepper both sides of the steak. Pour some olive oil into a large, heavy frying pan (cast iron is manlier, but nonstick will do just fine). Put it over high heat. When the oil is shimmering, use tongs to put the steak in the pan. Lower heat to medium-high. Let the steak cook for 2-3 minutes. Don’t touch it until it’s time to turn. Clean up the kitchen while you wait. An Alpha knows how to clean as he goes. Turn that sucker. Go 2-3 minutes more. This should give you a medium-rare steak. Remove the steak from the pan and let it rest on a cutting board for 5 minutes. Pour your love interest a glass of wine while you wait. Engage in some light petting. With a sharp knife, cut the steak very thinly against the grain. Serve with greens, steamed veggies, or a salad. P.S. Alphas also love sautéed mushrooms. Drain the same pan until there’s just a little oil in it and throw in a package of sliced mushrooms on medium heat. Cook out the liquid, about 5-7 minutes. Add salt and pepper and some minced garlic (but only if you’re not a Vampire Alpha, obviously). Serve on top of the steak. Chris Pratt. Photo from people.com. 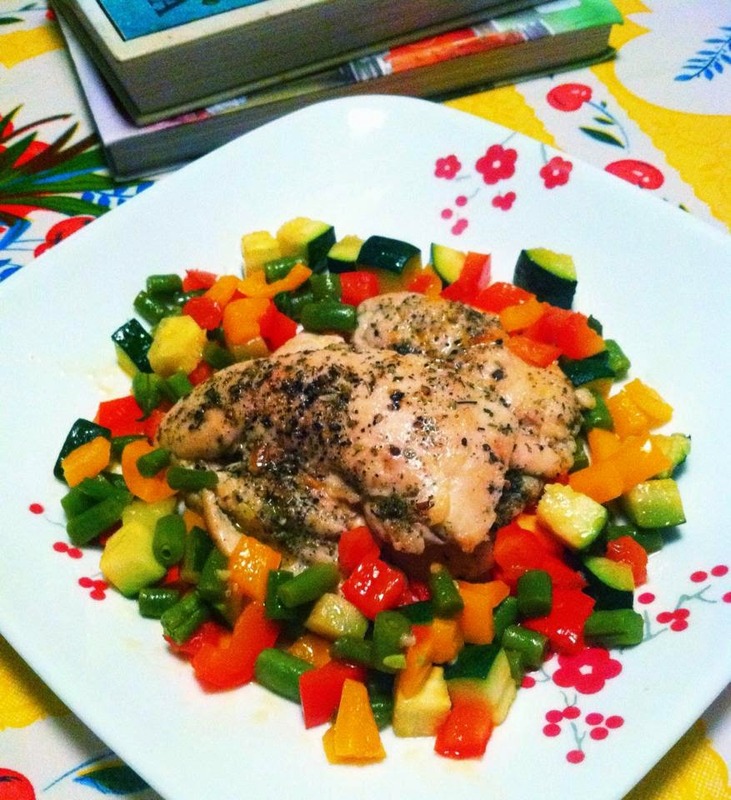 Chicken a la Alpha with mixed summer vegetables: zucchini, bell peppers, and green beans. Flex your arms. Kiss your biceps. Now let’s begin. Generously salt and pepper both sides of the pecs. Add the seasoning if using. When the oil is shimmering, use tongs to put the chicken in the pan. Lower the heat to medium. Cook 1 minute. Turn the pecs over. Turn the heat to low. Cover the pan with a tight-fitting lid and cook on low for 10 minutes. Set a timer and leave it alone. Alphas don’t peek. Clean up the kitchen. Brood until your love interest asks you what’s wrong. Make out with her, but don’t answer the question. After 10 minutes, turn off the heat, reset the timer, and let the chicken sit for an additional 10 minutes. Get a couple of pushups and crunches in. Slice the chicken against the grain. Serve with greens, steamed veggies, or a salad. Use a little of this alongside salt and pepper on your chicken and you will be a god of the kitchen. It is like catnip for ladies. Spanish fly has nothing on this. Put the dried herbs into a small food processor or blender and process to a fine powder. Use to season roasted or sautéed chicken. The mixture will keep well in an airtight container.